Not long after Toby died I was wandering past a shop at home and saw a jigsaw, I could not believe it, it was a picture of Cadgwith Cove. It was of the few must have purchases I have made since Toby died. It took me six months to finish that jigsaw. My concentration is not what it was. When I did finish it there was just one piece missing, unbelievable. It is a little piece of the sky and you know for me now it represents the place saved just for my boy. It is that little piece of heaven saved just for him. I love that that piece is missing. I hope now that I never find it. I have framed the picture, the mount covers the missing piece so no one can see, but for me it makes me smile because I know that Toby is in it, how special is that. Little did I know when I bought that jigsaw that a few months later I would be sitting on Toby’s Bench in Cadgwith Cove looking at that very view. I am a great believer in fate. Some things are just meant to be. My life is a bit like a jigsaw you know. As far as I was concerned it was a perfect picture. I had everything I wanted in life, I know my life was not everyones cup of tea but I was happy with it. When Toby died someone threw all the pieces of my life in the air and I watched them scatter. It was like confetti, floating down passed me, as it fell I did not really care, I was powerless to even respond. I did not watch where the pieces went or take any care of the ones I found. Gradually though I have tried to put that jigsaw back together but as time has gone by it is like I have forgotten what the picture was, what life was like before. I have not found all the pieces and the ones that I have found do not seem to fit back together any more. Since Toby died I have felt a range of emotions I did not even know I possessed. They have a depth of feeling that is impossible to explain and I never knew were possible to feel. Not all are good; some of them are very dark places to be, sad and lonely places, places that I do not chose to share. The funny thing is that over the past months loads of people have commented on how ‘strong’ I am, well let me tell you a little secret, I am not but I am getting stronger and that is Toby giving his gift to me. I have done things since Toby died that I never thought I would do. Write blogs, talk to newspapers, be on the telly. I have a whole new network of friends who I have only met through this. I am starting to find the pieces to that new jigsaw. It is going to take ages to see what the picture will look like. It will not be any thing like the old one. It will feature chickens and parrots, organ donation and fundraising, it will feature football matches and airplanes. 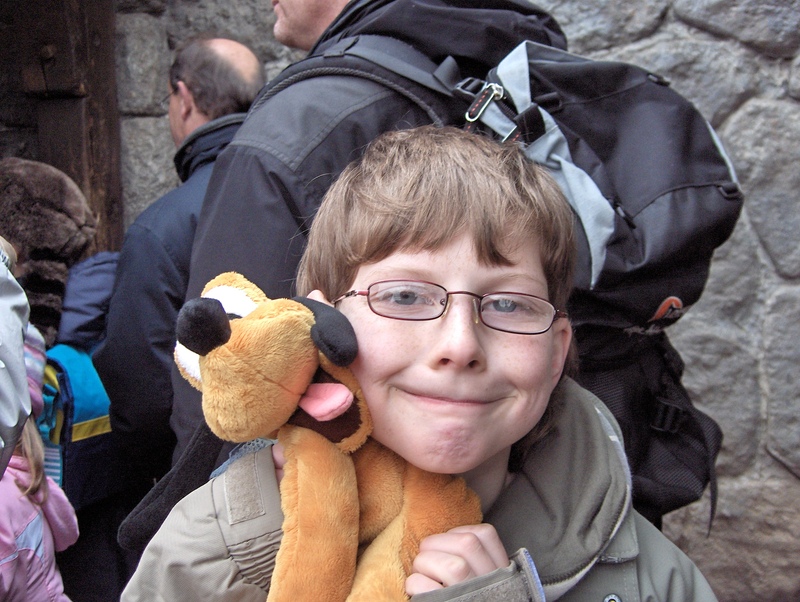 The one thing that I do know is that the golden thread will be Toby. I can not deny how hard I am finding it at the moment. We are doing so many amazing things because of Toby; who would of ever thought that I would write or be on the television! It keeps him alive but also brings a great sadness down on me, it is like a veil or a mist, cloaking all that I say and do. 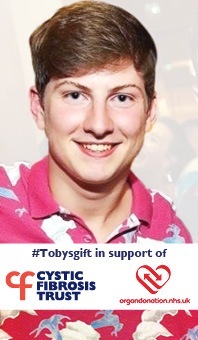 Toby forms a backdrop to my world, he is continually there in my thoughts in what ever I say or do. My stomach lurches when I feel him fall, my heart misses a beat when I see him gone, I smile when I remember the good times, I laugh when I remember the mischief. And all those sensations can happen in a blink of an eye. It makes it very hard for me to concentrate on anything else. It is not a world that I really want to share at the moment, my company is not good. It is strange you know to be at your happiest being sad. It is a very difficult sensation to explain. I do not need people to try and make me feel better at the moment, I just need people to let me feel, with that will come healing and who knows, one day a sense of peace. It is the middle of winter, a cold frosty morning. I am wrapped up really warm in the love of my family and friends. I like the cold, the frosty cobwebs that glint in the sun, the frozen flowers on Toby’s grave. I am walking across a frozen lake. It is beautiful but it is such a very long way to the other side and I know I have to get there, I can see the sunshine and feel the warmth on the farthest shore. I know I will feel better if I can get there. With each step the ice cracks, its a loud sharp crack, it is the sound of the pains shooting through my heart. No matter how carefully I tread, I can not stop the ice from cracking but I so want it to. Some days I just stop and stand really still and the ice goes quiet for a little while. I look up at the sky and will the ice to break, for everything to stop. I would like to fall like a bird soaring through the sky, and keep on falling, forget my world and loose the pain. Sometimes I look behind me but there is nothing but darkness now. When your child dies your life changes, there is no going back because that is gone. It is one of those experiences that honestly only those who have been through can fully understand and it is very difficult to explain. There are many things that I did before Toby died that I know I will never do again. There are certain restaurants that I will not go to as we never went without Toby so why would I want to go without Toby now? That does not make me sad or miss the restaurants, it is just a fact, there are plenty of others to choose from so why the need to go? Some things that I did before I will not do again, they just do not hold the same importance, my priorities have changed. It is not like other grief where returning to normal is a sign of healing, I have to find my new normal first. People ask me if I am ok and I say yes because I really do not want to have to talk to people about not being ok, I see a counsellor for that. I am surprised that people are not able to see and hear the ice breaking, it sounds so loud to me. I struggle to know what people do actually expect or want me to say. The truth is that I will never be ok but I am learning to live with that feeling. How can it ever be ok to never see or touch your child again, to not share a joke or a meal, to watch them grow into adult hood and live the life they should have had. I understand that people around me want to make things better but know that they can not. They can not bring my boy back or ever make me feel ok about him being gone. Some people choose to walk on that ice with me and I would not be without them, it means the world to me that they are there. Some others are standing on the lakeside just watching, feeling powerless and doing nothing. Others have not even come to the shore. Some of them should have walked that ice with me but could not, that makes me very sad. It is a relationship lost and I do not know if it can be repaired. When I stand still on that ice I listen very quietly, I can still hear it, still hear my boys heart beating, it makes me cry but makes me smile too. As long as I can hear it, Toby stays with me and that helps me to take that next step.